We first began publicizing our theme at the ALA Midwinter Meeting in February of 2018. Along the way we’ve reflected on the challenge of filling out a whole program around such a “niche” and “heavy” topic. At the 2018 RBMS Conference, Convergence, in New Orleans, we offered a participant-driven session called “RBMS 2019: Engaging the Community on Next Year’s Conference,” that generated fruitful programming ideas and introduced our colleagues to what we knew to be the deep and varied connections between special collections and climate change. We asked our 20 or so attendees to write down relationships they perceived between the functions of special collections work (borrowing from RBMS’s Guidelines: Competencies for Special Collections Professionals) and the primary impacts of climate disruption (as projected by the Intergovernmental Panel on Climate Change). We then asked attendees to write down relationships they perceived between our work and the main driver of anthropogenic (human-caused) climate change, which is greenhouse gas emissions, from various sources. The activity was meant to surface notions and draw new and creative connections between ourselves and both the causes and effects of climate change, and so the structure was pretty loose: write ideas on post-its, place them roughly at the intersection between the two concepts being connected, and then discuss as a group. This led to some fascinating and in some cases unexpected mappings between our work and the impacts of climate change. Many of these ideas have made it into the conference program, one way or another. Others have not. If you see anything missing, consider adding it to our program! We will have a call for proposals for “Pop-Up” sessions to serve more timely (or late-inspired) programming; look for that message over RBMS and other listservs/channels late next week. We are looking forward to joining you all this June to explore the many kinds of challenges and opportunities that our communities face in the midst of global climate change. We hope that you will come away inspired and equipped to grapple with new normals, new uncomfortables, and new ways of thinking about the age-old questions across the spectrum of RBMS work and experiences. 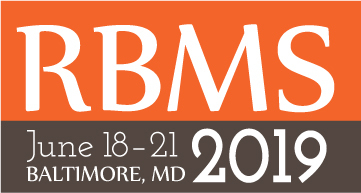 We are very grateful to the RBMS community for this chance to explore more deeply our own ideas and efforts around these issues, and to work alongside wonderful colleagues to build this conference program. We encourage the RBMS community to visit this blog regularly in the weeks and months leading up to the conference. Here you will find regular posts about the conference program, theme-related issues (including explorations of conference sustainability), highlights from Local Arrangements, and other information to help members and attendees gear up for the conference.